Who wouldn't get excited with that sound of water from a distance, walking through the curvy mountain paths and finally enjoying the mesmerizing waterfalls is one gala experience? Especially, during the monsoons and the post-monsoon seasons it gives an immense pleasure to travel to such destinations. Away from the buildings and traffic, let us make a tour around some of the best waterfalls in Maharashtra and get blown away from its virgin beauty! Covered in green coat, Mahabaleshwar looks jubilant during the rains. Amidst the green glory, Lingamala Waterfalls looks like an angel dancing her way. 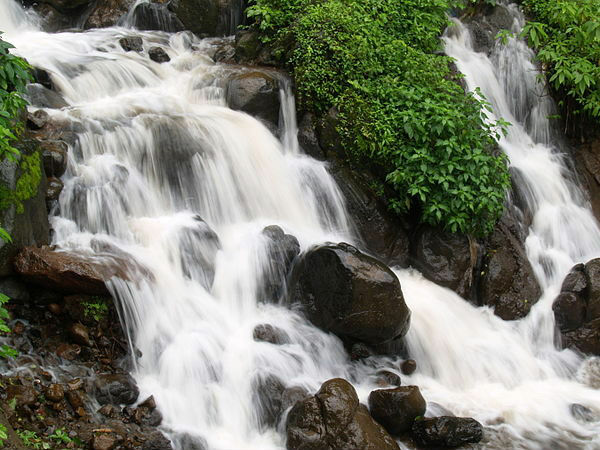 Lingamala Waterfalls is one of the prominent tourist places in Mahabaleshwar. Later the water drains to the Venna Lake. Lingamala Falls is 7km from the hill station of Mahabaleshwar. It is accessible through Mahabaleshwar-Pune Road. Those who love the combination of rain and green must visit Amboli Ghat during post-monsoons. Small streams and temporary waterfalls slithers around the ghat making it more exciting for the visitors. Amboli Waterfall is one of the mystic spots that should not be missed here. However, most other waterfalls are seasonal and best only during the peak times. Amboli is Sindhudurg near Sawantanawadi. It is around 114km from Goa. By Bus: Buses are there from major cities like Pune and Mumbai to reach Sawantanwadi. From there it is around 30km. By Train: Sawantanawadi is the nearest railway station. The spectacular Thoseghar Falls is undoubtedly one of the best waterfalls in Maharashtra. A series of waterfalls together form Thoseghar Falls which is located around 26km from Satara City. It is bliss to see milky water plunging through a great height amidst the beautiful lush green hilly slopes. There are buses from Pune to Satara and from Satara you can hire auto rickshaws to reach Thoseghar Falls. Legend says that the Pandavas of Mahabharata came here and took bath in this waterfall. Hence, it came to be known as Pandavkada Waterfalls. This plunge waterfall is one of the ideal picnic spots in Navi Mumbai. It is better to watch and enjoy the beauty of waterfalls instead of swimming here since a lot of . unfortunate incidents where people have lost their lives has been recorded in the past. Do stay safe when you pay a visit to this amazing Pandavkada Falls. By Bus: There are several buses from Mumbai to reach Kharghar. Buses are available from Pune as well as it situated on Mumbai-Pune Highway. By Train: Catch a train from Mumbai CST from Harbour Route to reach Kharghar. Get down in Kharghar Station or Nerul Station. Bhivpuri Waterfalls is one of the interesting locations in the town of Bhivpuri at Karjat. It is not only a tourist spot but also a place for adventure sports. Yes, Bhivpuri Waterfalls is one of the top waterfall rappelling destinations in India. The rushing waters of this falls provide an opportunity for adventure junkies! Bhivpuri is near Karjat. It is easily accessible by public transport. By Train: You can train to Karjat Station and from there take an auto to reach the waterfalls. Lonavala is a favorite spot in Maharashtra; its charm and beauty is unforgettable. Kune Falls is one of the main tourist attractions that add to the charisma of Lonavala. Interestingly, Kune Falls is also one among the highest waterfalls in India. Kune Falls is situated between Lonavala and Khandala. Go through Mumbai-Pune expressway to reach Lonavala Bypass and further go towards Khandala to reach the waterfalls. There is a unique feel in exploring such wonders of nature. These waterfalls in Maharashtra are certainly some of the top destinations which are not to be missed. However, most of these falls are seasonal and best to visit during July to December.